A stunning lab diamond eternity band featuring conflict-free emerald cut and round brilliant lab grown diamonds. Available options: platinum, 14k or 18k gold: white, yellow, rose. All of Ada's bridal pieces are fully custom and made to order with diamonds hand selected for quality, fire and brilliance. Free shipping and 30 day returns. Ada Diamonds Design Description- Perfectly practical, this lab diamond wedding band features alternating emerald cut and round brilliant lab grown diamonds in an eternity style with a re-sizing bar. This ring can easily be re-sized within 2 sizes. 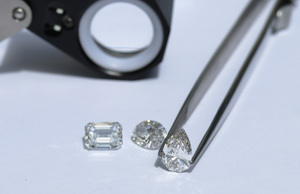 Starting at price assumes FG/VS lab grown diamonds in a size 5. Subject to availbility. Platinum available for an additional $300 fee. All of Ada's wedding bands are fully bespoke and made to order. Our friendly Diamond Concierge are here to help you create the perfect ring customized to meet your needs with our conflict-free lab diamonds hand selected for quality, fire, and brilliance. Inquire to get started or learn more about our exclusive Concierge Experience.